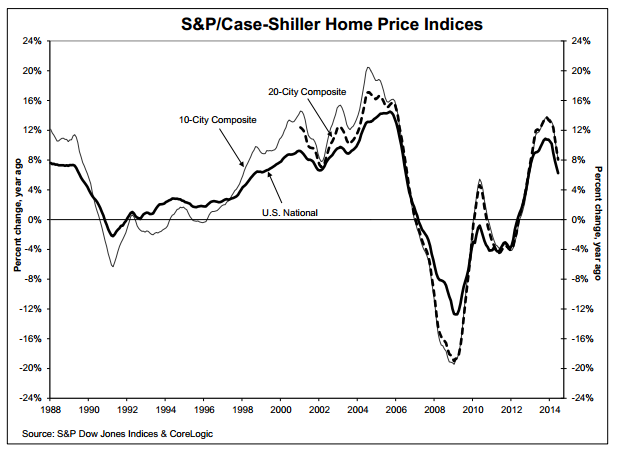 According to the S&P/Case-Shiller Home Price Indices, U.S. home prices continue to show a deceleration in home price gains. 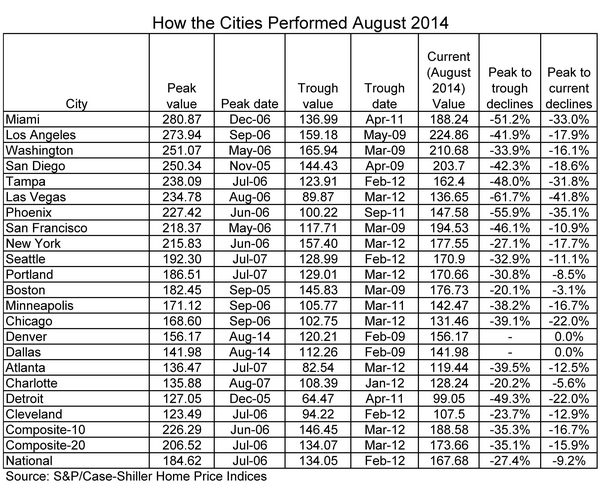 The 10-City Composite gained 5.5% year-over-year, and the 20-City 5.6%, both down from the 6.7% reported for July. The National Index gained 5.1% annually in August compared to 5.6% in July. “The deceleration in home prices continues,” says David M. Blitzer, Chairman of the Index Committee at S&P Dow Jones Indices. RealtyTrac’s September and Q3 2014 Residential & Foreclosure Sales Report sold at an estimated annual pace of 4,402,741 in September, a decrease of 1 percent from August 2014 and a decrease of 19 percent from a year ago. The median sales price of U.S. residential properties — including both distressed and non-distressed sales — was $195,000 in September, up less than 1 percent from August and up 15 percent from September 2013. Short sales nationwide accounted for 3.8 percent of all sales in the third quarter. Sales of bank-owned properties nationwide accounted for 7.8 percent of all sales in the third quarter. Sales at the public foreclosure auction accounted for 1.1 percent of all sales nationwide in the third quarter. The median sales price of a distressed residential property — in foreclosure or bank-owned when sold — was $130,000 nationwide in September, 37 percent below the median non-distressed sales price of $205,000. According to CoreLogic, for the month of September 2014, there were 46,000 completed foreclosures nationally, down from 68,000 in September 2013, a year-over-year decrease of 32.6 percent and down 61 percent from the peak of completed foreclosures in 2010. On a month-over-month basis, completed foreclosures were up by 4.7 percent from the 44,000 reported in August 2014. As a basis of comparison, before the decline in the housing market in 2007, completed foreclosures averaged 21,000 per month nationwide between 2000 and 2006. As of September 2014, approximately 607,000 homes nationally were in some stage of foreclosure, known as the foreclosure inventory, compared to 924,000 in September 2013, a year-over-year decrease of 34.3 percent. 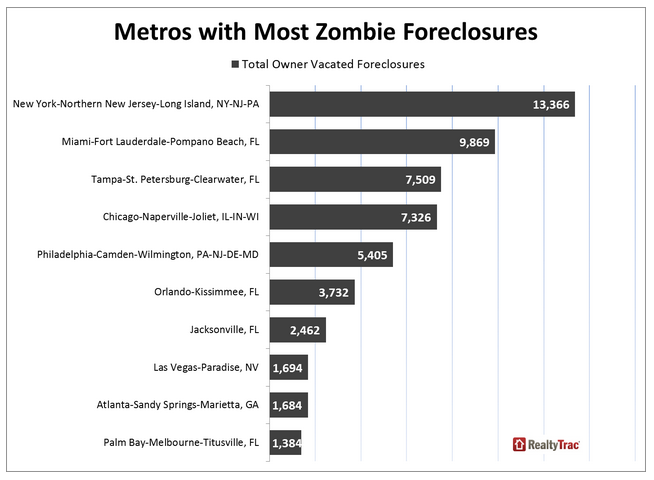 According to RealtyTrac’s Zombie Foreclosure Report, 117,298 homes actively in the foreclosure process had been vacated by the homeowners prior to a completed foreclosure, representing 18 percent of all active foreclosures. These vacant properties will likely end up as short sales, foreclosure auction sales or bank-owned sales in the future. “The most effective preventative vaccine for the blight caused by vacant, abandoned foreclosures has proven to be a short and efficient foreclosure process,” said Daren Blomquist, vice president at RealtyTrac. Glad you enjoy our site! I try to collate all the relevant “real estate investing” news and information every week.